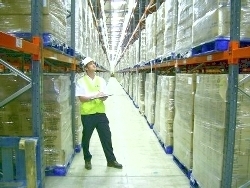 Hampshire Mezzanine Floors carry out racking and shelving safety inspections which is recommended under Health and Safety Legislation. Our Dexion qualified inspectors can either do a annual or a 6 monthly inspection depending upon the activity levels of the warehouse. All work conforms to S.E.M.A. and relevant British Standards. The aim of the racking inspection is to identify any damage to the installation, to report the remedial works required, and providing an estimate to carry out any necessary repair work. Hampshire Mezzanine Floors keep a stock of popular uprights and can often do repairs within a matter of days if the materials required are in stock. We will keep track of when your racking inspections are due and contact you to book a convenient date. For as little as £398.00, Hampshire Mezzanine Floors can carry out a racking safety inspection at your premises and ensure your companies warehouse safety. 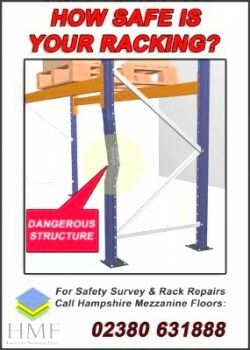 To book a rack safety inspection survey, please contact us.